Engaged community members are on a mission to bring Sandy Hook Promise to Moorestown. 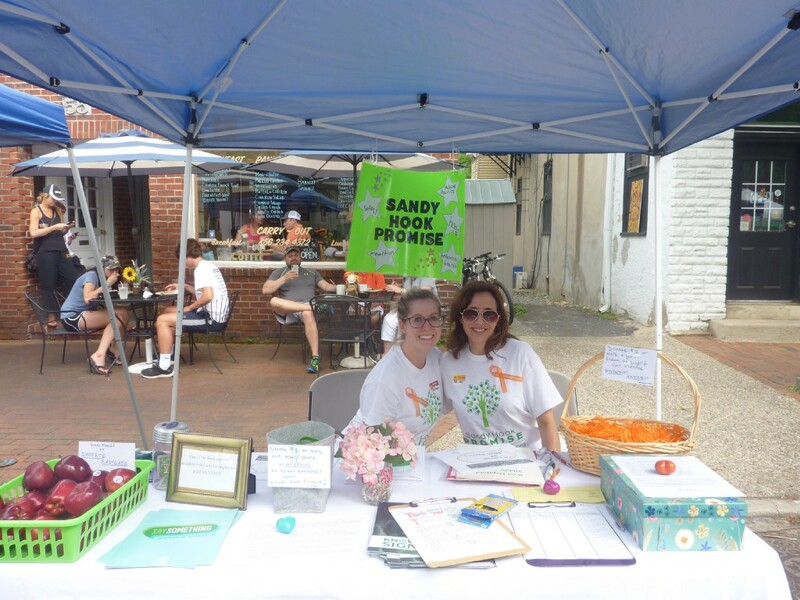 Mooresotwn Sandy Hook Promise volunteers Lauren Jones (left) and Allison Pond (right) shared information about preventing gun violence and other forms of violence and victimization before tragedy strikes at the organization’s Moorestown Day booth on Saturday, June 2. In the wake of a string of school shootings, Moorestown parent and social worker Lauren Jones was seeking a way to make a difference when she came upon Sandy Hook Promise, a national nonprofit that brings free, anti-violence programs to schools, on Facebook. She became a “volunteer promise leader” with the group online and connected with fellow Moorestown parent Ann-Linn Glaser, who had been involved as a promise leader for the past year. Together, the two, along with a handful of other community members, are on a mission to bring Sandy Hook Promise to Moorestown. While Glaser is handling general advocacy efforts, Jones is working to bring Sandy Hook programs into the Moorestown School District. On Wednesday, June 20, Jones led an in-service program for more than 100 Moorestown teachers to guide them through some of the nonprofit’s programs. “We need the teachers and the administrators to really own the program and bring it to life at school,” Jones said. Sandy Hook Promise has four safety programs, “Know the Signs,” that serve as guides for schools. The first, “Start With Hello,” promotes social inclusion by helping students to identify socially isolated students and learning how to reach out to them. The second, “Say Something,” encourages students to be the eyes and ears of the school by having steps in place for students to identify threats and report them to trusted adults. These programs can be taught by a volunteer promise leader. Jones said the remaining two programs require a Sandy Hook staff person come to the school. The third program, “Signs of Suicide,” teaches staff, administration and student leaders how to identify, intervene and get help for youths who may be depressed or suicidal. The fourth program, “Safety Assessment and Intervention,” is solely for adults and educates them on how to identify and assess acts of violence and the underlying causes. Since becoming a promise leader, Jones has met with several school district administrators about getting the program in the schools. Mary E. Roberts Elementary School, where Jones’ son attends, has already incorporated Sandy Hook Promise into the curriculum as of April 2018. In her meetings with Carole Butler, director of curriculum and instruction for the district, Jones inquired how these Sandy Hook programs could be embedded into students’ studies and was informed it could be incorporated through assemblies and health classes. Along the way, Jones has recruited the help of Moorestown High School students. Rising senior Anjali Akula said, at the student level, they’re working to incorporate some of the program’s ideas into the some of the clubs at MHS. Akula said mental illness is not talked about enough and implementing more curriculum about coping with life’s stresses and anxieties in a healthy way would benefit students. The Moorestown Home and School Association has allocated funds for Moorestown High School to make banners to try to get Sandy Hook Promise messaging throughout the school in the coming year. Jones’ goal is to get these programs into every school in the district. Fellow Moorestown mom and member of the group Allison Pond said for that to happen, it’s going to take everyone to get on board — administration, parents, teachers and students. Pond, Jones and their fellow Sandy Hook organizers are recruiting parents and students to build their volunteer base. At Moorestown Day, Jones and fellow Moorestown mom Allison Pond recruited 21 new members to the group. Today, their email list includes around 55 people. To find out more about Sandy Hook Promise, visit www.sandyhookpromise.org. To get involved, contact Lauren Jones at ldr0501@gmail.com.